Detroit Red Wings legend and NHL Hall of Famer Ted Lindsay has died at the age of 93. Lindsay had been in hospice care. 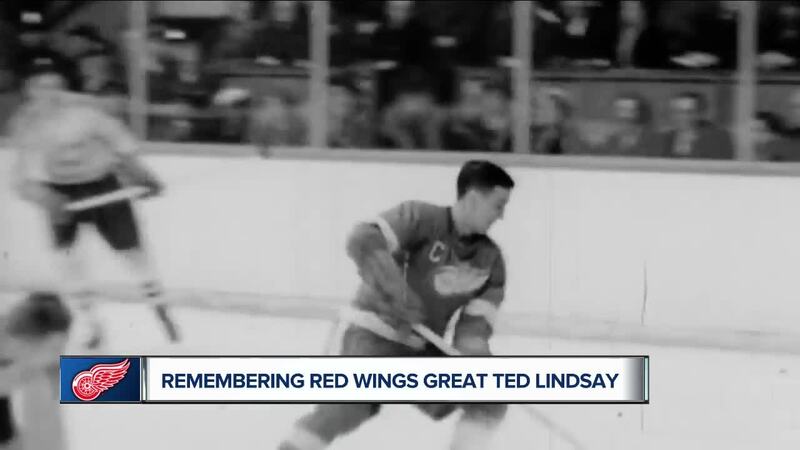 (WXYZ) — Detroit Red Wings legend and NHL Hall of Famer Ted Lindsay has died at the age of 93. Lindsay had been in hospice care. "I hated everybody. I had no friends. I wasn't there to make friends. I was there to win. It wasn't necessary that I score, but I figured I could be an integral part without scoring," Lindsay told NHL.com in 2016. "I had ability, I had talent and I didn't have an ego that I thought I was great. I realized I had to earn it. That was my purpose -- to be the best that there was at the left wing position. "Ted was a persistent, courageous and determined man both on and off the ice. He was a man of many firsts," the Lindsay family said in a statement. "We are comforted in knowing that the Ted Lindsay legacy will forever be a part of history and are so proud of the many lives he helped change for the better through his tireless humanitarian work. Arrangements will be announced when they are finalized." 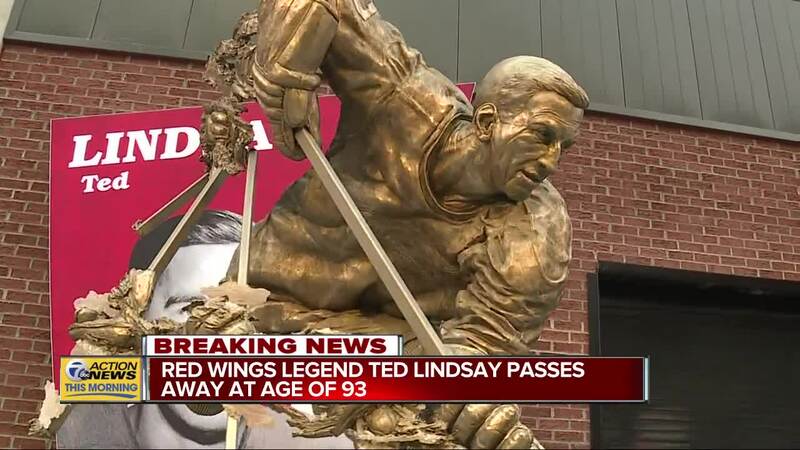 “Ted Lindsay was a Detroit Red Wings legend and icon, a hall of fame hockey player and Stanley Cup champion, and an even better person off the ice,” Christopher Ilitch said in a release. “He operated with a generous heart and was a great humanitarian, particularly to the Detroit Community and to young disadvantaged children." He is one of just eight Red Wings to have their jersey hanging in the rafters at Little Caesars Arena, along with Howe, Abel, Terry Sawchuk, Alex Delvecchio, Nicklas Lidstrom, Red Kelly and Steve Yzerman. During his 14 years in Detroit, Lindsay had 335 goals and 393 assists while also racking up 1,423 penalty minutes. He led the league in goals in 1948, won the Art Ross Trophy for the top point scorer in 1950 and was in every NHL All-Star game from 1947 until 1957. As for the nickname, Lindsay had 1,423 penalty minutes in his career with the Red Wings. "A 6-foot-2 guy, he can give me a shiner, he can cut me, I can go in and get stitched and come back out. He's not going to threaten me, he's not going to scare me, I'll be back and I'll scare him before the game is over," Lindsay added to NHL.com. "I loved the corners, that's where you found men. You found more chickens. You knew who the chickens were on the other team because they'd always back off a little bit. If I was coming, they knew they were going to get lumer or elbows or anything." Lindsay also played a major role in creating the original National Hockey League Players’ Association in 1957, and in 2010, the Lester B. Pearson Award was reintroduced as the Ted Lindsay Award, honoring the “most outstanding player” in each season as voted on by his peers. Previous winners since the renaming include Alexander Ovechkin, Sidney Crosby, Carey Price, Patrick Kane and Connor McDavid. Lindsay also established the Ted Lindsay Foundation in 2001 with John Czarnecki, a father of a 9-year-old boy with autism. They work to support research and educational programs focusing on the cause and management of autism spectrum disorders. So far, they have raised more than $4 million for autism research, with only 13 percent going toward operating expenses. In 2017, the NHL came out with a list of the 100 greatest players, and Lindsay was named among the players on that list.